Dell has announced new PCs with Intel's latest fourth-generation Core processors code-named Haswell, including a thinner and lighter XPS 12 laptop-tablet hybrid, which will offer up to 9.5 hours of battery life. The thin and light XPS 12 has been redesigned and will come with Intel's Core i5 or i7 chips, depending on the configuration. The laptop's battery life is more than three hours longer than its predecessor, said Cami Collins, XPS product manager at Dell. The laptop's announcement coincides with Intel's launch of Haswell chips at Computex trade show in Taiwan. Intel has claimed that Haswell chips will improve laptop battery life by 50 percent compared to previous Core processors code-named Ivy Bridge, which shipped last year. 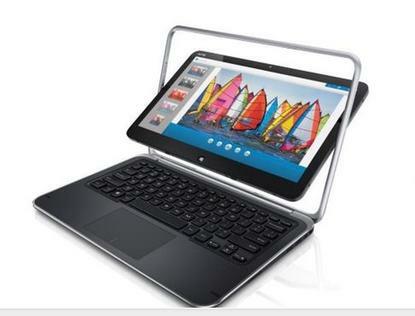 The XPS 12 offers laptop and tablet functionality thanks to a revolving screen attached to the hinge. The screen can be revolved in a circular motion and placed flat on the keyboard to turn the device into a tablet. The screen can't be detached, so the device could feel thicker and bulkier than keyboard-free tablets. The device is first a laptop, and can be a tablet when needed, Collins said. There are many people interested in hybrids and would like a keyboard, Collins said. For those who want a tablet first, Dell offers XPS 10 and Latitude 10, to which a separate keyboard accessory can be attached, Collins said. The laptop is also 63 percent faster, and graphics are 1.6 faster than the predecessor, Dell claimed. The laptop has a full high-definition screen and NFC (near-field communication) capabilities. Starting at US$1,119, the XPS 12 will become available worldwide, though a date was not announced. The hybrid will compete against a bevy of dual-functionality devices being announced at Computex by Acer, MSI and other companies. Dell also announced the XPS 27 all-in-one with Haswell processors and Windows 8. The all-in-one has a 2560 x 1440-pixel screen, and a Thunderbolt port so peripherals like external storage devices can be hooked up to the PC. The PC supports up to 2TB of storage. It is priced starting at $1,599 and will become available worldwide in June. Optional solid-state drive storage and Nvidia discrete graphics cards are available. Dell also announced the XPS 8700 desktop with Haswell chips for users who want the ability to expand, upgrade and connect peripherals. The desktop can support up to 32GB of memory and 4TB of storage in four bays. It also has six USB 3.0 ports to host external peripherals. The price of the desktop was not immediately available, but it will become available worldwide.